Chris Martenson: Welcome, everyone, to this Peak Prosperity featured voices podcast. I am your host, Chris Martenson. And it is November 28, 2018. And today, we're going to be talking with Charles Hughes Smith about his latest book. It's title is Pathfinding our Destiny: Preventing the Final Fall of our Democratic Republic. Hey, not a minute too soon. You know, America teeters on a precipice right now. Certainly, if you watch your feed on Facebook or Twitter it's like this imminent demise. But it goes back further than that, right. We know that our government in the United States is really captive to special interests and big money. The Citizens United versus the Federal Election Commission decision by the U.S. subprime court – yes, I said subprime, and I meant to – was a truly awful, horrible, no good, ridiculously bought and paid for decision that accelerated the downfall of democratic processes and citizen control of the elected parts of the government. But was that really it? I know some people say that was the moment. Here to discuss with us the idea, though, that it's deeper than that, that there's no single decision or fix or tweak that is going to really get at the issues in a way that could give us a future we could believe in. We've got Charles here. Charles is a very prolific author and blogger. He runs the site oftwominds.com. He's a frequent contributor to and guest on Peak Prosperity. Hey, all around great guy as well, personal friend too. Charles, welcome to the program. Charles Hugh Smith: Thank you, Chris. And thank you for being able to discuss these topics today that are often lost because, of course, our whole culture is short term. The political system has a cycle of every two years. The economy is basically every quarter. And so to talk about issues that have taken decades to play out, it's like what? Chris Martenson: I know. So we'll try and keep this short, anyway. Just kidding. [Laughter] So Pathfinding Our Destiny. In this book, you make the claim – you make the claim – let's get right to the heart of it – that the crisis that America faces isn't just political. You say it's structural. Take us through your thinking here. What do you mean by that? Charles Hugh Smith: I think if we – the starting point for me is that we should look at very complex systems like the way we look at ecosystems. We look at them as systems dynamics, and then we're looking to see how evolution and adaptive pressure builds and generates responses within these complex interactive systems. And so, I think that an ecosystem is really the best metaphor or analogy we have for our economy, which has tens of millions, hundreds of millions of participants and all doing various little things that create inputs that then impact other feedbacks and so on and so forth. So, if we look at our economy as a system, then there's inputs and then there's processes, and then there's outputs. And if we just look at those in sort of large chunks, we see that much of our inputs are social, what we might call social constructs. We're not really talking about physical laws like gravity or something like that. We're talking about a social construct which says the only way that we're going to survive and prosper is growth. And what is growth? It means consuming more resources and more goods and services. And without growth we die. That's the basic input, the social construct we live in. And within that construct there's another one, which we've talk about many times, which is since we don’t have enough money in cash, currency, to do all this wonderful stuff, we got to borrow it. And that's perfectly fine because we're borrowing to grow more, and we're going to be able to pay all the debt we've accumulated in 400 years because we're growing so much faster than our debt. And so, those are the two sort of social constructs that we have. And then we have a political system which is becoming increasingly, as you say, tied into money. Now, people have always said, like from 100 years ago, money is the mother's milk of politics. Money and power have always coalesced around political power. But in the last, say, 70 years, post-World War II, the central governments and central banks of the world have grown immensely in their centralized power. And one of the theses I'm proposing in my book is centralization itself is now the problem, and we've been told for 400 years that it's been the solution. Just centralize power and wealth into tighter and tighter control and then that will somehow solve whatever problems we have. Chris Martenson: So this idea that we have these structural issues, and how many could we really point to? I will tell you that I think structurally we have a broken voting system in the United States. I could go on and on. Obviously, the money system is broken by design because it's designed to be exponential. And we could have different money systems, but the one we have says gotta keep growing, and we got to keep growing by whole percentage amounts all the time. And, obviously, that has a systemic sort of problem at its root. So we look at this, you mentioned ecosystems. And we have positive and negative feedbacks, things that keep things in balance. Too many foxes, well, they eat all the rabbits, then the foxes starve and the rabbits come back. So, the little positive feedback loops and negative feedback loops. In the political system there's supposed to be checks and balances which would be the equivalent in this metaphor of those negative and positive feedbacks. But those checks and balances, really, I think, are just so missing in action. And I did mention the Citizens United v. FEC decision there by the Supreme Court which, by the way, I love that one. You know why I love that one? Because it was five to four. Oh, it was so close. Five to four. These five voted for, these four against it. And then later, Kelo v. New London where property rights were taken away, it was five – four. But it was a different five and a different four. It's always like oh, we're so close. But if you track what the Supreme Court's been up to, they’ve been slowly removing those checks and balances and tilting the playing field toward government power. Whether it's even in the case of Kelo v. New London, that's just a municipal power. They're like, eh, they have rights over property. Not at all clear where they found the constitutional basis for a local municipality having the power to seize your property for eminent domain for a better use. That was a stretched decision. So, as we look through all of this, I can make a case for why we have a structural problem with the money system based on its inherent mathematical design flaw problem. But what I just raised with the Supreme Court feels to me like a different process and a different problem. How are those connected if they are connected at all? Charles Hugh Smith: Right. That's a great question, Chris. And my basic answer is that they're connected through the dynamic of centralizing power as the solution to whatever problem exists. And so, in other words, in the Great Depression era, the Nacasian [PH] solution was well, let's eliminate all the falderal of markets and hundreds of banks, many of which have failed, and let's just centralize all this banking power in a handful of one central bank with a handful of folks who will then set policy for all the hundreds of millions of citizens and every financial institution in the economy. And so this sort of idea that command / control was the solution, I think that is what's feeding, that cultural narrative, is what's feeding the political and financial concentration of power and wealth. And so, when the nation's at war, well, let's just centralize all the power into the President and his top advisors. And if there's a financial crisis, then let's centralize all the power so we can have a handful of folks deal with that decisively. And so, what these mechanisms do is they destroy markets which, in small scale, have benefits, right. Open markets, transparent markets of buyers and sellers, at least at a small scale that works. And then it destroys the political process of checks and balances, as you say, because – I think there was a study that came out a couple years ago where some sociologists studied the decisions that Congress had made and concluded that they basically ignored the general public's interest 99 percent of the time. And so, when you claim that we're a democracy and yet the ruling organs of control, the Congress, legislature and the courts, all of which now ignore the public good or the public opinion, then it's really hard to claim that we're still a democracy. And so that's why I say the final fall. We've already fallen, as you've pointed out, really far. There's not much left. Chris Martenson: Well, right. I love the definitions of that. So when we talk about democracy, what are we really talking about? Because I think people, in my judgement, in the United States, falsely believe that they have a democracy. And I think, for the gold standard, for full on democracy is every vote counts. And not only does it count because your voting system captures it and you have the ability to audit that system to verify the results. so you don’t have to trust them. And the votes also count because the electorate is informed and is casting a vote that's actually worth something, rather than a bot vote or one that's ill informed or misinformed. So on that second point, I can look at the structural failings in both the educational system and in the media conglomeration and structure in the United States and say there's a very badly informed electorate out there, as well. My judgement. People can disagree. But the gold standard democracy would have full representation, every vote counts and you have an informed electorate. What we have today, in my view, it's very much not a democracy, if only for the reason that you just mentioned. I mentioned the front end of democracy, which is how the votes happen. On the back end, you would want those votes to mean something in that the will of the people is represented. And you just mentioned a statistic which is 90 plus percent of all decisions and laws and things and acts that get passed by Congress are against the will of the people. They're for other purposes and special interests. So, do we have a democracy at all? Is there one here to save? Charles Hugh Smith: Yeah. It's a very good question, Chris. And to some degree there's this strange phenomenon that parallels the financial system where the appearance is presented as the reality. Like we're presented with GDP growth, and that's the appearance of growth as opposed to translated to actual prosperity that's spread amongst the masses, which we know it’s not. And in the same way, we have an election, so it creates the appearance of democracy, and it's really not backed up by reality. There's another point that I made in the book which I'd like your feedback on which is our system of governance, broadly speaking, is all about advocacy. In other words, some group is supposed to form. It could be citizens who are mad as heck and not going to take it anymore. It could be a corporation. Some group will form and advocate for some action by the government. And so it's this competing interest of advocacy that are supposed to turn into a big stew that somehow generates regulations and laws. And so that's supposed to be a competitive battle of various advocacies. But what this system fails to do is consider the social good. In other words, if there's just a bunch of competing interest groups, which is basically what American democracy is, even at its most fundamental level, well, who's advocating for the common good? And, of course, we find that no one's advocating for the common good. And so the common good is completely left out of the picture. It's like who wins the advocacy that benefits themselves and their allies? And so we've lost a sense of well, what is the common good? Chris Martenson: Let's take an example of that. I think that's maybe no more starkly illustrated than in the U.S. sick care system, or healthcare system, which is an amalgam of all these different competing interest groups which, in theory, is supposed to work towards a common good once you average and sum everything out. So you’ve got your hospitals, and you've got your plan administrators and insurance companies and doctors and patient advocates. And somehow you put all that mix in and you should end up with something approximating the central limit theorem of what people want. And we don’t have anything of the sort, of course. On a dollar adjusted, outcome basis the United States is far and away the worst country in the entire world, spending the most and getting least in terms of outcome. So when I look at that system right there, to me, that's a perfect example of what you're talking about. The common good would say we want to have a system that ultimately is fair and equitable and people deserve access to healthcare when they need it, quality healthcare and all of that other stuff. But we don’t have that, do we? Charles Hugh Smith: No. You're absolutely right. That's an excellent example. And you mentioned the media before. And, of course, again, this intense concentration of power into the hands of whatever smaller group is also visible there. Six media companies control most of the media in the U.S. It used to be six banks, but now I think it's down to three or four, control most of the financial system. And we see this is one sector after another. Facebook dominates social media. Google dominates search and ads and so on. And this makes perfect sense in the system we have now. In other words, well, this is really efficient, and it's very profitable. If you can establish a cartel or a monopoly or a quasi-monopoly, then you can just raise your prices, and people have to pay it and it's profitable. Everybody wins, right? The shareholders win. The managers win. The public, well, eh. They don’t have a choice. And so, I think this sick-care is a perfect example, as you say, because it's all these so-called competing interests, all they do is basically strip the carcass of whatever money there is. And delivering actual healthcare, well, that's secondary, at best. Chris Martenson: Well, this speaks to the idea though, if there isn't a common good that's based on things like what's right, what's decent, what's honorable, what has integrity, what matters for the next generations, things like that. As we triangulated around this topic, it just appears to me that the common good in the United States is money. And if you can make money at it, it's kind of a laissez-faire, wild west, if you can make money at it anything goes. Oh, are you making something that kills insects indiscriminately? You're making money at it? Go for it. Oh, do you make cluster bombs even though those are outlawed everywhere but we can sell them through some back channels? Go for it. Whatever it is seems to be okay. Practically every religious text there is talks about how the love of money is the root of all evil. I mean, is that maybe a common element in all of this? This is just money and power running to its natural Romanesque conclusion? Charles Hugh Smith: Well, I think you're right in the sense that that was one of the topics I was trying to explore in the book is the initial conditions of a system – we call it teleology. It creates in own instate. So if you create a system with the intimal conditions that you have here in the U.S., like you say, money is everything, it's the arbiter of all value, then you're going to get a certain output. And you're not going to able to change that output unless you change the initial conditions. But I want to toss out an idea that we seem to have even degraded in the last, say, forty years, in the last two generations. Back when we were younger, the nation seemed to coalesce around the idea of protecting air and water. And even a conservative president such as Richard Nixon felt moved by the general sense of a common good. And so laws were passed and efficiencies were mandated. And as a result here, two generations later, the air quality and water quality in the U.S. is considerably better than it was forty years ago. But we seem to have lost that ability to coalesce around something that's really obviously in the common good. And, as you say, the impact on insects, which has a huge financial cost, as we all know, through pollination and so on, and even that can't get any traction, even though it has a huge financial impact. But have we lost the ability culturally to agree on anything regarding a common good? Chris Martenson: That's a very interesting idea. And let me riff off of that common good. One of the more horrifying things I think I saw come through our education system was something called Common Core. And this was some sort of new educational something or other, clearly designed by a committee, so it had the trunk of an elephant, the body of s snake, wings. It's just this crazy thing. And it's inarguably a failure statically and quantitatively. But meanwhile, there are countries that do this whole education thing very well. And somehow we've lost that ability to coalesce around the common good, to even say the emperor has no clothes and say, no, that's a really bad idea. I would think, if anything, the thing of the children movement always seems to have a lot of power behind it. When it comes to something as obvious as making sure the next generations are properly educated, we seem to have, in the United States, have lost the ability to have what I would consider to be a reasonable conversation. It's equivalent to saying there's no bugs hitting my windshield. That's a problem. Let's have some energy around that topic to say, wow, the United States is way behind all these other industrialized nations is terms of every measurable output of test taking and whatnot. Maybe we should do something about that. I sense almost no traction on any of these things. There are two things that happen. First, people just shrug their shoulders and go, eh, what are you going to do? The second thing is there are defenders of the system as it exists. They like it that way. And you had, in a recent blog post, you wrote, "For our political and financial elites will cling to their centralized power, doing more of what's failed even as civil society unravels." That's kind of at the higher level. But people defending the school system churning out substandard students by every international measure, why is that people will cling to things that are arguably, provably not working? Charles Hugh Smith: I think you’ve really gotten to the core of the system, which you might call entrenched interests pursuing their self-interests. And that's really what we're talking about here. As you said, we all understand human nature, right. There's a lot of moving parts in human nature; we can be compassionate, we can be empathetic. We're not simply rational economic machines grinding through everything to maximize our profit, although that's the way our financial system and economic system is set up. There's nothing in human nature except an overriding urge to maximize personal gain by any means available at any cost. We don’t care. That's kind of the way this system is set up. But, as you said, politically there were checks and balances on that kind of rapaciousness, and we seemed to have, as you say, lost that. And I think what the key structural difference is that when you ruthlessly centralize power in monopolies and state cartel kinds of structures, where there's a handful of players control the whole system, you’ve eliminated the ecosystem. You’ve done the equivalent of planting a monoculture and then spraying it with Roundup so there's no insect life. And so you get a great crop for a few cycles there. But, of course, you're destroying the soil, you’ve destroyed the ecosystem around it, you’ve created food that's no longer nutritious and on and on and on. And so we've created a monoculture economy and political system, if you will. And the solution to that, I think, it a massive decentralization of power and capital. And that would require rebuilding the society and the cultural narratives and the economy from the ground up. Because right now, anything that attempts to decentralize wealth, power and capital is snuffed out. Chris Martenson: Exactly. And we are discussing the book Pathfinding Our Destiny with Charles Hughes Smith. And Charles, you didn’t write this as another problem definition book because I'm going to turn now to the subtitle which is Preventing the Final Fall of Our Democratic Republic. It seems the subtitle, would I be wrong in suggesting it's saying all is not yet lost? Charles Hugh Smith: Right. I think we're in the final stage here of collapse, as we've been discussing, meaning that we don’t have decades. We've already burned through the decades where we could have reformed the system. Now we're down to, I think, a matter of years. And so that's for – I used the term final fall. And I think that my choice of the word pathfinding, my idea here was hey, look it, we have to explore a lot of different solutions. It's not like we can just go back to the same old models from 1940 or 1840 or whatever: like let's go back to pure capitalism or let's go back to Communism or let's go back to socialism as it was defined in 1870. I don’t think we can just rely on these old models. I think that the world is now too hyperconnected and things have advanced beyond where these models from, basically, the 19th Century, can be applied and we can hope or assume they're going to work. So, I'm looking for a pathfinding, like taking what works in a practical way without trying to slap an ideological solution on a really complex system. It’s fascinating. I'm sure you’ve read even more studies than I have. But if you go in and study where there's an ecosystem that's failing, that it's breaking down, and then the U.S Army Corp of Engineers or somebody comes in there, or some agency, they often try to get a grand solution. And that usually ends up being even more disastrous. And it turns out that what seems to work is little things where you're introducing more diversity and letting things play out. In an economic sense we'd be saying if we had a thousand regional banks that had nothing to do with the Central Bank, they weren't controlled by some higher agency, that they would probably introduce a lot more competition and innovation into their local markets than three mega-banks. And so, that's kind of like the model I'm suggesting as our last best hope. Chris Martenson: Well, I love it. The whole decentralization, I think, is going to be a wonderful direction to go. For instance, I was just reading just yesterday about how – I forgot who was the author of the book that this article was based on – but the idea was that you could track the loss of civic function with individual engagement with things like Rotary Clubs, Elks Clubs, Granges, whatever those things were, churches even. So that localized, small group sort of participation, where you get a feel for how things get done and what happens and it's at a scale you can wrap your arms around. You know, politics is always messy, particularly at the local levels and all of that. So that loss of engagement really seems to be a defining feature of our time. And I think what you're arguing here is that that's not a one-way trip. Progress is not all of us locked in our living rooms watching Netflix and staring at our 4 X 5-inch Smartphone screens. So there's an art to this. We swung really far down this path on not really paying attention, allowing things to sort of persist as they will. There's nothing that centralized governments love better than people that aren't really paying to what they up to. And it does take a lot of fighting to stem that tide. Are you suggesting here that there's still time for people to, say, vote their way out of this? Or are we going to have to start doing this exploring, as you called it? Are we going to have to start just sort of pathfinding and making mistakes and trying things out at the local level, and hope that something sticks here? Charles Hugh Smith: I'm kind of proposing two possibilities. One would be that we have a – I confess immediately that this is sort of pie in the sky – but in crises, whether they're financial, political, social or all three interacting, they offer opportunity. In other words, people start questioning well, gee, is this really the way we want to go? So one possibility would be to have a national discussion about what's our national strategy? In other words, as a nation, are we going to pursue this path of centralization and advocacy of special interest and let the system collapse as a result? Or could we actually have a conversation about a renewed national purpose? That value system change would then start defining our political and economic choices as opposed to just these narrow, self-interested advocacy groups just trying to maximize profits or gains. So we could have that conversation. If we don’t have that conversation, then I think we're going to see a decay of things that people take for granted here, like there's always going to be gasoline at the gas station, that your money is still going to be more or less worth the same amount six months from now and that your pension will show up in all of its glory. And all these things are going to start falling apart for all the reasons we've talked about many times. Then we'll have a second opportunity to change things, like to decentralize power and capital and let people in the local communities actually have a say. Because part of why, as you say, the loss of engagement is people realize they're powerless. You go to the meeting, you go to the bike club, you lobby the city, and then nothing happens. And it's all like the system had been centralized to the point where people have dropped out partly because they realize they're powerless. So, as things unravel at the centralized level, then power starts becoming possible. Control and investment, these kinds of things become possible at the local level. But only when the centralized 'solutions' collapse. Chris Martenson: Now, could we argue maybe that that centralization is already hit its zenith and is headed down again. Because we would note things like the riots that are happening in France right now or the Catalonia breakaway, Brexit, Trump, all these other signs that say the populist is getting restive again. And that's because in this quest for centralization, the economic oxygen was really vacuumed out of the room of the regular people and put into this little tiny chamber where a very small number of elites live, and they’ve been breathing fine. So is that, is this something that sort of self corrects on its own? And if so, I would guess maybe you're arguing here we want to do that on our own terms rather than other terms, other terms rhyme with things like civil more. It's like that, right? Charles Hugh Smith: Exactly. And I guess my main point is that every economy, every society, every culture is a social construct. And as we've talked before, it's based on a value system. In other words, which defines priorities and incentives. And so if we can consciously choose another set of values that's more toward social good and a common good and we're transparent about the incentives that we want to create, then I think we have a chance. But if we don’t tackle it on that systemic, structural level, then it's just going to run to fail. Chris Martenson: Well, you know, I know a lot of younger people – I'll define that as under 30 – who really feel like the system’s already past saving, that the generations before them made some really horrible, bad, no good decisions, spent a lot of money, piled up a lot of debt, don’t have a lot to show for it, that kind of stuff. And aren't really too positive about how things could possibly work out here. Is there a generational aspect to this conversation? Charles Hugh Smith: Undoubtedly. And being an old baby boom geezer, I don’t make any claim to represent the younger people's point of view or their life experience. But I think history tells us that there are turning points, right, and, of course, as we've discussed on Peak Prosperity many times and in other contexts, there's the Fourth Turning book and theory that every 80 years or so, every four generations, there is an existential crisis of some time where the nation gets to choose its future path. And so, I think we're coming up on that juncture, not just from the Fourth Turning, but just from all the issues that you and I and other guests have been discussing for the last ten years. And so we're going to have an opportunity. And I think it's not going to be a thing where you break down the barricade and you enter the new chamber and it's meet the new boss, same as the old boss. I think we all understand that's not the solution. What we need to do is decentralize wealth or capital. And that may require things that are far outside the mainstream. For instance, local currencies, instead of having a central currency, maybe we'll have a huge proliferation of local currencies which will find their own value. Chris Martenson: Well, yeah, and if those we actually tied to something of value in a way that made sense and weren't just simply decreed by fiat and under the control of a small group of unelected people, then you could really make a case that the money system really should work for the people, not the other way around. But, of course, when your money system is the thing driving the ship, it works wonderfully for the people who are at the top of that money heap because they don’t have to work, and they can vacuum up almost all of the value that's created. And if they're not rapacious about it, they’ll leave enough of that value back in the system so that it'll perpetuate and keep going. But if they overdo it, which seems to be the want of humans through history, if they overdo it, then they actually extract more value for the very top layers than is actually being produced. And that's where the restive populations come in. It's clear to me that the elites have overdone it. would you agree? And, if so, how does that begin to reverse itself given elites have a very poor track record of willingly letting go of anything no matter how much they have under their control? Charles Hugh Smith: It's an excellent topic, Chris. And, again, going back to our ecosystem kind of analogy, there's selective pressure on all areas of a complex system. And so, what we're really talking about is the selective pressure on the financial and political system is building because it's not really adapting to the new economy or the hyper connectivity of the world as it is now. It's basically trying to – the elites are clinging to this old structure of concentrating power, and then running it all from the top. And as that decays and fails, they're going to continue clinging to that. But eventually those systems break down. And then we could call it kind of like punctuated equilibrium, in terms of evolutionary theory. At some point the ecosystem collapses. To use your analogy, the rabbit population is completely destroyed. In our system it would be the debt serfs. I mean, people just stop paying. There's no more debt serfs because everybody just defaulted. And so at that point the foxes starve to death, and that would be the elites. But all ecosystems rebuild with pieces that come in and adapt more successfully than the species and individuals who died out. So I think we have a grand opportunity here to experiment, which is really what nature is. It's a bunch of experiments go out there and respond to the adaptive selective pressures. And those that adapt quickest and most effectively succeed and occupy the niche. And those experiments that didn't work pass away. So, I think we can look forward to that as maybe this gigantic mix of experiments, going forward, as the current system decays and collapses. There will be ideas that pop up, groups that pop up, and we're just going to maybe have a free for all in which the niches that have been emptied of centralized power, those ecosystems will now be available to a much broader range of ideas and interests. That's my hope. Chris Martenson: That's a wonderful hope to have. And I love concrete examples, so I want to just turn to what's happening in the markets today. This is November 28, so for those listening later on in the week, today the Fed Chairman Powell spoke. Left a couple key words out and added a couple new ones in. So the reading, whatever the signals were that came from the Oracle of Delphi, that's happening here. And the markets just beyond excited. The Dow Jones is up nearly 50 points at the time of this recording. This feels to me a little bit like something what we were just talking about. Look, the Dow was down a few percent, not even 10 percent, and the Fed had just started a rate hiking campaign, which didn't even actually draw liquidity from the markets. And even being down just a few percent, there was political pressure from Trump on Powell to stop that. There was people complaining all over Wall Street because the pain was just too much to bear being down not even an ordinary correction amount. A little bit of volatility and the Fed already feels the pressure of the elites to step back and put a put on the market, assure it can't fall anymore and get those excited animals spirits. They're really defending something here that feels indefensible to me which is the concentration of wealth, which is the idea, dumb as it is, that stocks have to always go up in price which is that the Fed is even responsible for these things in the first place. A lot of ways that I see failings in this, but this is our system now. It really feels very out of control, to me, like there's really not much of a vote to be had from my standpoint here. But this really feels like a – today is almost a perfect example of what you're talking about in this book, about how the elites are clinging to their outdated ways. Charles Hugh Smith: Right. And there's a great phrase which captures part of what we're trying to describe here, which is "Good ideas don’t need force." And in the book, I describe the difference between force and power because those are often conflated. In other words, well, what's power? It's the power to force somebody to do something. But that's really force. Power is like you win people's voluntary kind of cooperation. That's real power. And so we've lost – the United States has certainly lost it. and it may be a global phenomenon of all centralized authorities is the idea that we can force everybody to follow these rules, and we can force the system to act like we want it to act. And that is hubris and all complex systems basically show that you can't hijacked a system and force it to do specific things to benefit a few at the top of a heap. And so what' I'm kind of proposing instead of trying to force the system to keep doing what works for those at the top, that we seek ideas that are powerful by persuading people to cooperate because it benefits not only them but the common good, as well. And that's really, I think, the human instinct, is that we do understand. We want to do well for ourselves, but we also realize it has to work for everyone else, too. Chris Martenson: And so in terms of beginning to get to the conclusions of this which is what can an individual do? What is that needs to happen here? What is it that you're really asking people to consider as individual courses of action here, given all this? 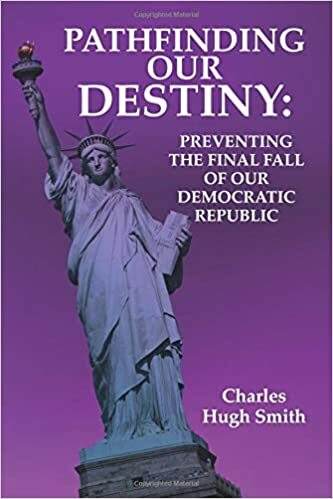 Charles Hugh Smith: I have written other books that had more specific agendas like that, personal agendas, and this book is a little light on that. It's more like, I guess, the conclusion at this kind of higher, systemic level is to ask people to understand that you're not going to be able to reform the current system as its structured and that we're going to have to radically decentralize power, wealth and capital. And we're going to have to open the doors, so to speak, to a bunch of experimentation to find out what works best. And so, I think it's actually just asking people to develop those values. And I think those values are going to be the ones that are adaptive and flexible and most likely to bring personal success, community success, to those people that hold those values and understand that that's the future. The specifics of that is, of course, whatever adds to your own adaptability and flexibility and resilience is what you want to keep doing. You want to build resilience, flexibility and adaptability. So you want to have buffers so that you're not always on a wafer thin close to collapse yourself or your household. And you want to build buffers of food, wealth, essentials and skill sets. And you want to be able to engage positively with other people. As you say, our sense of how to engage people productively, it's been narrowed down to you work for a corporation, which is a hierarchy and tells you what to do. And that's our engagement. That's obviously dysfunctional. So just develop the skills to productively engage people. Chris Martenson: And be flexible, decentralize, sustainable, all of that, resilient. I love it. Of course, these are the things that we've been advocating for a while, simply because it something is unsustainable, it'll either change or stop at some point in the future. And if you say that we have these systemic issues where these are structural, systemic issues, they're not going to be reformed. They really need to be rebuilt. Well, it that's the case then, obviously, the best way to hold and conduct oneself in the scheme of things there is to be resilient and to be flexible. Because stuff's going to change. Hey, it's changing all around us right now. So with that, Charles, tell people, what's the best way for you for people to get a hold of your book? Charles Hugh Smith: Well, visit me at oftwominds.com. You can download a free section; the first section of the book is free as a pdf. And then you can order the book from Amazon, as dreadful as that may be. Or pop me an email and I'll send you a signed copy. We can work that way as well. Thank you so much, Chris, for letting me talk about the book and these systemic ideas. Chris Martenson: Thank you. And thank you for wading into these incredibly important issues; and I agree, we do need to spend more time thinking about the larger picture stuff here. Because I agree with you, we're not going to vote, tweak, reform or otherwise slightly modify our way out of this. It's time to think big. So, thank you for doing that. Charles Hugh Smith: My pleasure. Your discussion touched on, but never really dug into what I see as the core issue: Starting in the Reagan era, our culture has lost its awareness of the common good as the necessary balance to self-interest. What has replaced it is all-consuming self-interest. This means there is no longer a shared sense of all of us being in this together. No wonder all that's left is division and rancor. With nothing binding together the citizens of this nation, there is no longer a functioning social contract. There are just interest groups, playing a zero sum game. Americans have been enculturated to value individualism over the common good. Not only is that trait deeply woven into the American character, I believe that training was accomplished through the public relations efforts of industrialists terrified by the spread of Bolshevism starting in 1917. I don't know if it is possible to nurture a sense of the common good back into the culture, but I don't see any recovery from this dark point if we can't. I'll add, though, that individuals can recover it. Buddhism has given me access to deep feelings of interconnectedness. These are the source of my sense of the common good. I always understood our country was established as a Representative Republic, not a true Democracy. Where in a democracy, the concentrations in densly populated areas could easily outvote the less densley populated areas, thereby eliminating the vote of the people living in the country. Hence the reason for the electoral college, with the problems that it has. Nevertheless, I agree the system is broken and probably beyond saving the original concept that was America. Possibly a slide into socialism is what is coming. Chris mentioned people shrug their shoulders and say "what can you do" and there are some that are content or happy with the system as it is. I belive that where we are in society today, there is a majority of the population that is receiving part or all of their income from the government. Why would someone who is receiving something from the government, whether they work for it or it is handout, want to reduce or eliminate it? They don't see their income or subsidy as part of the problem. They are on the gravy train. Little to no competition. Perfect example is our failing public education system. In our state, Washington, we had a House Bill on the ballot a year ago, 2242 I think, that would impose 12.9 Billion dollars in property taxes over 10 years to "Fully fund K-12 Education". It got voted down statewide 62% to 38%, however, the court ruled that it must fully fund education K-12 and it got imposed anyways. Teachers went on strike demanding more money. Even after as much as a 20% salary increase, they still complain this hasn't fixed the problem. I'm sure in a few years they will be back crying about how they just can't continue unless they get another influx of tax revenue. My property tax went up $600. I now pay over $4000 a year on State and Public school taxes and I don't use them. I home school and I pay for my own curriculum. The first thing that this new tax will go towards is increased salaries. "We must pay for good teachers" is the argument, and the non crittically thinking masses swallow it. State law requires them to teach 1080 hours per year (RCW 28A.150.220) Schools are required to teach a year no less than 180 days ( WAC180-16-215) They spend $18,000 per student for what amounts to a graduated 12th grader that functions on a 10 year old level. (Personal interaction with these students is what tells me that) The teachers make more on average than the privately employed in our area ($82,708 vs $67,106) The superintendent Jean Schumate makes over $230,000 a year, and this doesn't include the insurance benefits and retirement they get on top of their salaries. They are building a brand new $150 million dollar high school that also got voted through locally to replace the existing High School. It is not going to improve the outcome of the students, still the same Pavlovian style of stimulus training/reward system is in place. I don't know of any of these teachers that have held a job privately in their lives. They have no concept of what it means to be self employed, like myself. To compete for income on a level business environment. They have no clue what it takes to perform a job where you are reliant upon other businesses to MAKE A CHOICE to call you so you have an opportunity to earn money. They are at the trough demanding more every year. You work 2/3rds of the year. Go get a second job if you want more money. I don't want to hear your whining you aren't compensated enough to be in an underperforming government monopoly. Go comptete in the private sector and shut your pie hole. You are a part of the problem. Eliminate the NEA. Break up the teacher unions. Give parents the choice on how to educate their own children. Let them keep their property tax portion and decide where they want to spend it. If you want to use the public system, fine, pay the $18,000 per yer, per child to get that fine education. Stop demanding that I supplement your abdication of raising your child. If you are not competent or confident enough, let someone else raise your child. Better yet, don't have children and you'll be doing the rest of us a huge favor. Adults, teach your own kids. Don't give them over to someone repeating what someone else told them. Yes a storm is coming, and you do not want to be on the receiving end if I have to make a choice of food for my family or funding your retirement. What a great episode! I wish I could sit down with Chris and Charles to discuss this topic over a couple beers. I totally agree that the only feasible way forward from where we are now is decentralization. I'm not so confident that we can get there. And we need to get there before the steel trap of the surveillance state is sprung around our ankles. I'm a fan of Nassim Taleb, and the idea of lots of small, competing jurisdictions (sort of like the Founders meant the country to be) really jibes with his ideas in "Antifragile". Antifragile systems (that get stronger with stress) generally have many semi-independent parts and the competition and evolution of those parts under stress is what makes the system stronger. I'm glad Charles hit on the idea of coercion vs choice. To me this is the key structural and moral issue. Whenever we implement top-down, coercive solutions to anything, the result is sub-optimal and often the opposite of the intent. Choice is the key. Why don't our bosses, or spouses, just beat us with blackjacks? Because we can quit, or we can get a divorce. We have a choice. We would choose to spend our time with someone else. People without a choice are called slaves. Coercion is the use of force to remove choice. Coercion is evil. Coercion is the primary tool of big government. Coercive top-down governments have officials with no skin in the game (again Taleb); if their policies backfire there are no repurcussions (can you spell "John Bolton"?). I don't, however, like all these ideas of "the common good." How in world would you determine that? A commenter above mentioned public transit, and how wonderful it would be to have a good transit system in the US. And yet, probably 95% of the people living here would hate that idea. So we are back to appointing our (enlightened) selves as The Annointed, and if the rabble won't listen we'll start cracking skulls, or at least we'll steal their money to reshape the world the way we know it should be. This just gets back to totalitarianism really fast. I say let everyone have choice, coerce no one. Also, there were a lot of comments like "all anyone cares about is money" and "everyone just wants growth" etc. That's "common knowledge" but I challenge you with this: write down a list of everyone you know, and then put a check next to those who care nothing about others, who only want to get money, who disdain helping others, or contributing to society. How many of these people actually exist? I think we are engaging in faulty thinking when we say stuff like "my and my 6 friends are cool, but everyone else is a rapacious capitalist out to destroy the world." It just ain't so. You might be able to name 30 nasty people/companies, but there are 300,000,000 people in this country. 30 bastards ain't so bad. Let's not throw out the baby with the bathwater. Keynesian economics is, of course, a complete sham. But an economy can "grow" not only by making more trinkets, but by making the same stuff with less energy, less material inputs, etc. We don't need more stuff to have more profit. Ok, now I really need a beer! Life in America has become one big game of Monopoly, where the longer the game goes, more players end up w nothing while a few (eventually one) end up w everything. Take capitalism, infuse it w trickle down economics, then add Citizens United, and here we are. Great points made by Charles throughout this podcast. As someone who chose not to have children, I, too, as a Washington resident, raised my eyebrows at the increased property taxes. Property taxes will figure prominently in the transition to a new system such as Charles describes. Charles has outlined something that may be a solution -- but there will be a lot of pain in the interim. There will be a great deal of resentment from those who are not part of the defined benefits system as taxes increase dramatically. (I realize that teachers and public employees pay a portion of their retirement.) Once we recognize -- or are forced to recognize -- that most jobs are B.S. jobs, our infrastructure will change. For example, the Washington State Investment Board (WSIB) on behalf of Washington teachers and public employees owns One and Two Union Square. Signature office buildings in the Seattle CBD. At some point these buildings will be worth nothing. 99% plus of those who work there are in B.S. jobs. Another example: WSIB bought a resort on an island barely above sea level in the South Pacific. If projections are correct this property will be literally and figuratively underwater in a few years. Who will pay? The Washington State property tax payer. Why am I familiar with these investments? Before I realized that I worked in a B.S. job, I was an investment officer with WSIB. I actually recommended that WSIB divest (in 1995-1996) of a portion of One and Two Union Square in order to eliminate to our exposure to a single city. What a dummy I was. It's all a matter of timing. I used to think that I was ten years ahead of the times. Now I think that I am at least 20 years ahead. : ) It's hard to know how quickly it will collapse. But, as S7 expresses, there are going to be many unhappy campers in the interim. I couldn't help but reflect on this cursory discussion of the this topic. Decentralization may appear as the logical solution to the malaise modern society finds itself in, however, what has evolved over the centuries is the concept of agency in human interactions. In other words, "let somebody else take care of the details", because I'm too busy and can't be bothered. A close examination of Roman law always held that an obligation between two people was a bond that could not be broken without the consent of the primary respondents in a civil society. The day the concept of agency developed was the day things began to go south. It is amazing how we have lost all concept of an obligation that requires recourse in order for a society to function. Everything from borrowing a 5 note to extended warranties has limited utility where theft is a common trait. Whether it be clipping coins, shrinking the size of your favorite candy bar or that 12 oz. beer that is now a 330 ml slurp of insipid, fermented, carbohydrate swill, the evidence is there that our society is breaking down. A friend of mine recently purchased a $1200 smart refrigerator that after two years later crapped out and cost him $500 to fix. The recent discovery of some customers that their Sears appliance's extended warranty will still cost them a monthly charge despite the company's liquidation, only highlites the predictament we find ourselves in. I recently replaced the bushings on my old pumpjack that has been working non-stop for over 40 years and will now go another 10 before I rebush the parts.. How many things do we all own that won't last a decade due to the quality of the design and materials. And, if we wanted to fix them, they have become so specialized that only an agent can fix them. I guess that is another name for government, eh?